When we listen to music which is written in a spare and minimal manner, it is easy to project our own emotions on what we are hearing. And whilst Morton Feldman intended his music to be secular and non-spiritual, the overt spirituality of the music of Arvo Pärt means that it is easy to consider spirituality as one of the strands of minimalism. The sense that if the music is quiet and intense, with a great use of silence, then it must be spiritual. Listening to this new set of music by Jeffrey Roden led me into thinking about overt or not so overt, spirituality in minimal music. The two disc, on the Solaire label, contain music for piano played by Sandro Ivo Bartoli, twelve prayers, untitled 10 pieces and the passing of a king, and chamber music played by the Bennewitz Quartet, Szymon Marciniak (double bass), Sandro Ivo Bartoli, Wolfgang Fischer (timpani) and Johannes Kornfeld (trombone), the many latitudes of grief, untitled quintet #2, untitled quintet #3 and leaves. The first disc contains the piano music, spare, quiet pieces where the sound world very much reminds you of Morton Feldman. This is minimal rather than strictly minimalism, and the music has the same sense of individual notes placed in the air, and use of silence, that we expect in Feldman. Yet Feldman was explicitly anti-spiritual, whilst Jeffrey Roden is the opposite. In his article in the CD booklet, a deliberately elliptical piece entitled Introductory Notes (written entirely without capital letters), Roden talks about seeing a statue of the Virgin in Venice, saying 'the creator of this Mary had imbued her with the spirit of the idealised Mary and his success in his task has without doubt brought a great deal of comfort and a sense of proximity to god for many people. I had to ask myself: what other goal could be more worthy than this one'. So who is Jeffrey Roden? Tobias Fischer's article in the booklet, Jeffrey Roden - Instead of a Biography is almost as elliptical as Roden's note. But we can gather that Roden has had an eventful life, spending a long time as a well known bass player performing with well known artists, as well as moving into an area where he recorded an album like The seeds of happiness where he used just his bass and nothing else. But since 2010 Roden has been working with composer Ian Krouse as his mentor and has ventured from simply experimenting into composing a full oeuvre of contemporary classical works. For Tobias Fischer, "the sacral dimension of Jeffrey's compositions are derived directly from the sacral dimension of his 'real life struggle'". 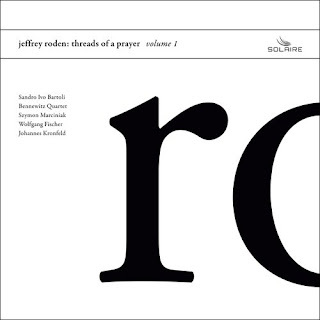 Yet listening to this music, you could as easily think of the intense secular soundscapes of Feldman as the sacred minimalism of Pärt. It is perhaps easier just to put the music on, concentrate and listen. Like Feldman, Roden has no pre-conceived plan and simply places his notes in a way which is done by instinct and intuition. With the piano alone, the notes hang in the air and he often uses just a single line to profoundly evocative effect. As played by Sandro Ivo Bartoli the results are mesmerising. The second disc contains the music for a group of instruments, and the sheer fact of writing for string quintet, piano, timpani and trombone in the many latitudes of grief makes the music rather more dramatic and moves it into a different world. Roden writes for the eight instruments in a manner similar to the solo piano music, with individual notes hanging in the air, but these hanging notes overlap and the sense of harmony generated is far more conventionally tonal than appears in the solo piano music. I found this to be true of all the music on the second disc. Whilst I Roden's chamber music is evocative, it was the solo piano music which I thought moved is art to a different dimension. As I have indicated, the booklet is a trifle frustrating preferring to imply and suggest rather than providing real information. We also get the poems written by Roden which align to the many of the pieces, and provide a further key to the spiritual dimension of the music.